A pair of studies released in the past week shows the deep connection between oil and gas revenues on state budgets and economies in North Dakota and New Mexico, states with large natural resources in the west. The study from the North Dakota Petroleum Council (NDPC) and the Western Dakota Energy Association (WDEA) released Wednesday outlined nearly $18 billion in extraction and gross production taxes for the state from the oil and gas industry over the past decade, constituting approximately 44 percent of total tax revenues to the state over that time, and over 50 percent for the past five years. In addition to billions in tax revenues to the state’s coffers, the study detailed $1.2 billion for water projects, $875 million for local transportation funding, $4.5 billion for the state’s Legacy Fund, and $7.3 billion for infrastructure across the state. Millions more were invested in the state’s Outdoor Heritage Fund for conservation and recreation, and tens of millions have been dedicated to school funding, with four counties receiving more than $100 million each over the last ten years. The economic contributions are similarly consequential in New Mexico, where 80 percent of the oil and gas production occurs on state or federal lands. The New Mexico Tax Research Institute and accounting firm Moss Adams found that the state received 20.7 percent of government revenue as a percentage of estimated production value in 2017, higher than the eight other states surveyed: Colorado, Kansas, Montana, North Dakota, Oklahoma, Texas, Utah, or Wyoming. 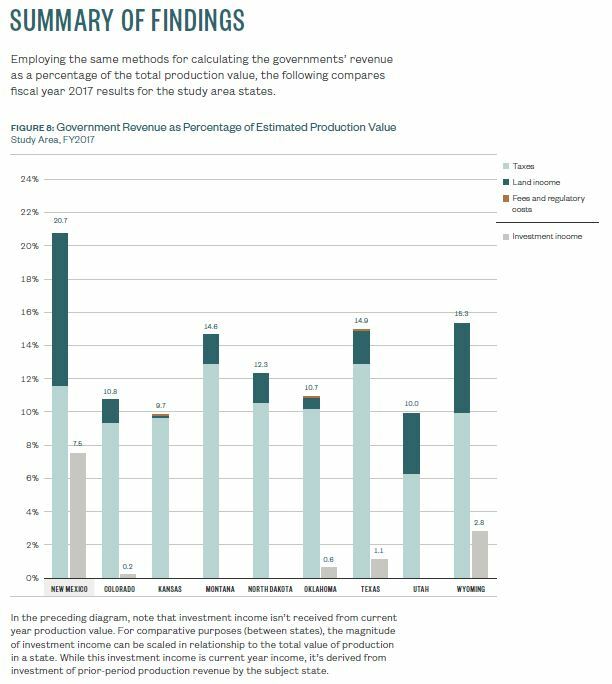 New Mexico had the third highest tax revenue on oil and natural gas production at 11.5 percent, lower than Montana or Texas (12.8 percent) and comparable (though higher) than other nearby or competitive states like North Dakota (10.5 percent) or Colorado (9.3 percent). The state is the 3rd largest oil-producing state, behind Texas and North Dakota, and is the nation’s 9th largest natural gas producer, according to the Energy Information Administration. In addition to direct royalty and tax contributions and government revenue structuring, New Mexico enjoys another benefit, direct and predictable income streams due to investment in permanent funds, the study concluded. “There’s a third fiscal component resulting from the investments of oil and natural gas revenue: royalty revenue investments in permanent funds. This provides New Mexico’s government with large, stable revenue stream additions in the form of investment income from the historic management of oil and gas resources,” the study’s authors wrote. “The states that receive significant, direct benefits of oil and gas market value royalties also realize the additional benefit of creating predictable investment income streams to help stabilize their respective governments’ budgeting tasks,” they added. Overall, government revenue from oil and gas production in 2017 contributed $3 billion New Mexico and $2 billion in North Dakota. Both states fell just behind Texas’ $12.7 billion. New Mexico also received nearly $635 million in royalties from U.S. Department of Interior for fiscal year 2018, which goes to fund education and infrastructure like roads. The top recipient of DOI revenues, the state saw $972 million in Bureau of Land Management lease sales in the September 2018 quarterly lease sale, leading all western states in that category in 2018.